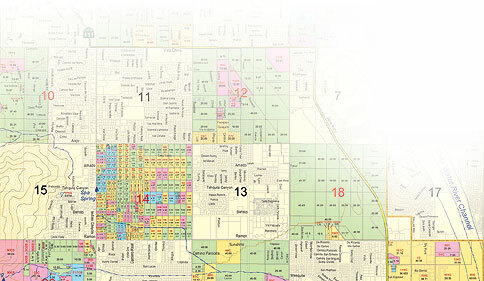 In 1850, when the United States seized Mexican land holdings in Southern California, it divided much of the land into townships of numbered grids of one-mile-square sections. This process included the traditional home of the Agua Caliente, who had lived in the desert for thousands of years. But by 1860 the U.S. Government was keen to get the Southern Pacific Railroad to build a connecting line between Los Angeles and Yuma, Arizona, thereby—they imagined—opening up trade between L.A. and the Colorado River region. All the odd-numbered sections of Agua Caliente land along the railroad’s route were given to Southern Pacific, which in turn sold them to fund the railroad. resulting in a checkerboard. Those grants came with a price: Land could not be sold and there could be no profit. Long-term leases were forbidden and business endeavors severely restricted. Still, the Agua Caliente had their land. The jewel was Section 14, which contained Sek-hi, the boiling mineral spring. Eventually, a booming resort economy developed alongside an enforced subsistence economy. To further undermine tribal authority, national politicians devised a plan in which property would be taken from the tribe and redistributed to individual tribal members. But this allotment system was never successfully instituted and eventually ordered abandoned. By the early 1940s, as much as two-thirds of the population of Palm Springs lived in the western half of Section 14. These residents—almost all Mexicans, blacks, and Indians—made up the cheap labor pool that serviced the resort economy. They lived in shanties there because they were cheap and also because it was nearly impossible to find other housing in segregated Palm Springs. But in 1959, two things happened. The federal government granted the Agua Caliente the right to negotiate long-term land leases of up to 99 years, which suddenly gave the tribe access to vast wealth. But fearing “artful and designing persons,” the government set up a conservator system that would protect the Indians. Enter Judge Hilton McCabe, who also professed concern for the simple and ignorant natives. He appointed judges, lawyers, land agents, and businessmen as conservators—just the people the Agua Caliente needed protection from. The conservators granted themselves huge fees and commissions. Ultimately, the California Attorney General intervened and ended the program. Meanwhile, during the 1960s the city fathers continued to seethe at the eyesore of Section 14 so close to the glamour of Palm Springs. They wanted the shacks gone. They refused to run utilities into the section, so the only available water came from wells and there was no electricity. Eventually, the tribe ended the tenants’ leases and the city condemned the houses. The city sent in bulldozers and knocked down and burned the houses in a series of raids. Residents would return from work and find their homes and belongings destroyed. By the 1970s the Agua Caliente were finally in a position to profit from their land holdings. Lucrative long-term leases were negotiated with major hotels. 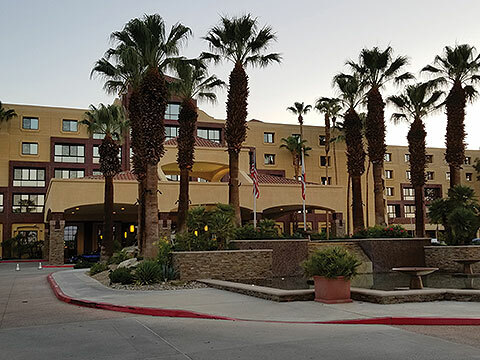 The Renaissance Hotel—site of VVA’s Leadership Conference—sits right in the center of Section 14. The tribe then hit the jackpot when they were allowed to build a casino on tribal land. Many VVA members went to the casino—either to eat or gamble or both—during the conference. For a more detailed history, visit “Section 14: The Other Palm Springs” at the National Museum of the American Indian on the National Mall in Washington, D.C. The exhibit opens February 7, 2019, and runs through the year.